The Audinate Dante AVIO 1-Channel Analog Output Adapter allows you to use the analog gear you already own with your Dante audio network. It provides audio engineers with a cost-effective solution for adapting analog power amplifiers, powered speakers, or analog compressors and equalizers, delivering the interoperability, performance, and scalability of Dante network connectivity. Compact and built for the road, the AVIO is automatically discovered by the network and is ready to use when connected. It features one balanced, line-level output equipped with an XLR connector and delivers high-quality audio at up to 24-bit/96 kHz with configurable gain and attenuation, low total harmonic distortion, and a 20 Hz to 20 kHz frequency response. The AVIO supports Dante Audio over IP and AES67 RTP transport formats, and is compatible with Dante Domain Manager (DDM). Note: Requires the use of a network switch with POE (Power-over-Ethernet) capabilities or the use of an 802.3af-compliant PoE injector device (both available separately). 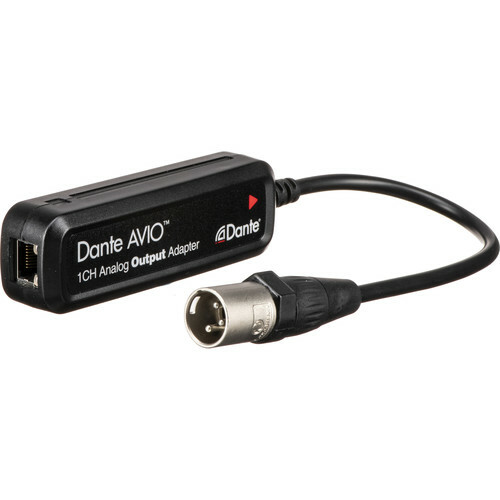 Box Dimensions (LxWxH) 9.2 x 8.6 x 7.9"
Dante AVIO 1-Channel Analog Output Adapter for Dante Audio Network is rated 5.0 out of 5 by 2. Rated 5 out of 5 by Gannon from Great way to distribute audio We recently used this in our large church building to send audio from our Dante-enabled mixer in our main auditorium to the nursery. They are about 300' apart, so pulling audio cable would have been difficult and time-consuming, but since we had network throughout the building already, this device made it simple. Plus, since it's digital audio, there's no chance for extraneous noise to be added over long cable runs. We also utilize video-over-ip, so our switches are already set up for POE and multicast with IGMP snooping, and this device works flawlessly with that configuration. Dante controller makes it easy to route audio and multicast streams, so we're able to distribute to multiple overflow locations easily and without hogging a lot of bandwidth. We plan to use these devices often in our upcoming building expansion, and it will save lots of time and money not having to pull audio cable and buy distribution amps. Rated 5 out of 5 by Steve from Dependable little device This thing works perfect. Hook it up to your network with POE, and it shows up in Dante Controller just like its supposed to, then works without another thought! Indicator lights by the RJ-45 are handy to be sure everything is working. Were using this with a POE injector, and there are no problems. Welcome to the future!